Spring road, originally uploaded by Jonne Naarala. Signs of spring are in the air (or road)! 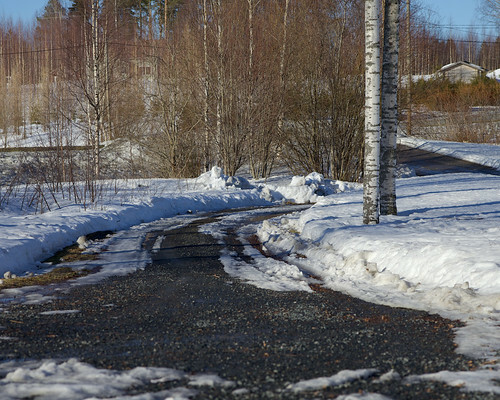 Driveway is almost free of snow now. All other places in our yard are still very white but we can see slow process here. Well, this is already a T-shirt weather for the Finns! Isn’t it wonderful? Just saw grass for the first time since months. Thanks for visiting, Sven! Yes, I am indeed waiting the spring. Increasing light, and especially those light green tones everywhere. I commented on this yesterday, but I don’t see it showing up. Interesting that we have had so much snow this year, the local ski resorts are usually shutting down this time of year, but rumors are they are staying open much later this year. I hope the spring and summer find your spirits lifted my friend, and with summer on the horizon enjoy that break.